As you drive along Muscat’s “Lovers Road” you are most likely to be distracted with the views of the beautiful coastline, cruising cars and large name coffee shops but not often do people notice the gem that is Qurum Nature Reserve. It is discreet and unassumingly tucked in behind Starbucks and from the road it looks like a tangle of forgotten trees and waste ground. Little do people know that the nature reserve is so much more than that, this mass of Mangrove trees is an integral part of protecting Muscat’s coastlines and supporting the habitat of wildlife and marine animals. 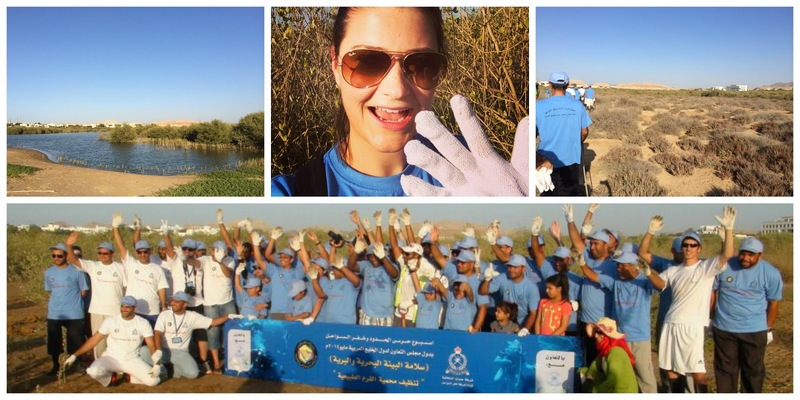 An initiative from the Ministry of Environment and Climate Affairs (MECA) combined with the ROP Coastguard issued a public invitation for volunteers to assist in cleaning up the nature reserve. As the old saying goes “Many hands make light work” and that was exactly the thinking when they appealed to the public for help. This also granted the volunteers a rare peek into the locked off world of the nature reserve and help them to do their bit to give back to the community. Over the past 7,000 years the areas of dense vegetation around Oman’s coastline have dwindled leaving it vulnerable to the elements. Since 2001 the MECA have been working hard to increase the numbers of mangroves along Oman’s coastline to preserve and protect the land and the animal lives that it supports. Utilising the four permenant mangrove nurseries they collect seedlings, grow and mature the young trees and transport them around the country and plant them. As we walk into the nature reserve it is immediately beautiful and serene and feels a million miles from the busy road with flashy cars whizzing by. At first I was confused at how the litter makes its way into the park if the gates are locked but Badar explains to me that the high tide brings litter from the beach and the rain in the mountains washes down towards the sea bringing litter from the streets with it and becomes entangled in the trees. With our refuse bags in hand we headed off in different directions to cover more ground picking up the foreign objects blighting the land. From small items like juice bottles to larger items like tires and rugs none of these belong in a nature reserve and every effort was made to remove them. With 70 volunteers, both local Omanis and Expatriates, everyone worked hard in the beating sunshine and with the efforts every single person made a difference. I have no doubt that the rubbish will be back soon but for now, at least we did our bit for now. Educating people is the first step to improving the situation. For a full run down and more info on Mangrove trees you can read my article in Y Magazine by clicking here. Have you taken part in any community activities recently?